Heat gas or charcoal grill. Place bratwurst on grill. Cover grill; cook over medium heat 6 to 8 minutes, turning frequently, until thoroughly heated. Meanwhile, in medium bowl, mix sauerkraut and dressing. To toast buns, place cut side down on grill during last 30 to 60 seconds of cooking time. Place bratwurst in buns. Top each with about 1/4 cup sauerkraut mixture. 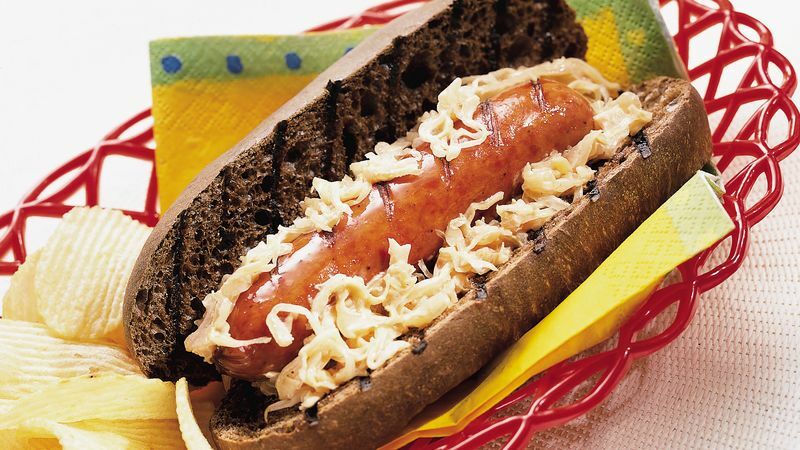 To reduce the fat in each serving of this recipe by about 13 grams, use light bratwurst.